Even great content can’t get you more customers until it’s seen by the right people, at the right time. It takes smart strategy to deliver the right message to each of your buyer personas. And that message has to be customized for every stage of their buyer’s journey: awareness of their problem, consideration of a solution and finally, a purchase decision. When that content delivery strategy creates an airtight map leading from stranger to customer, it’s an effective conversion path. Convert leads for less by developing conversion paths for all of your buyer types, ensuring every lead has the right information and opportunities in every stage of their buyer’s journey. Like all effective marketing, conversion path development starts and ends with your customers. So do we. Our team begins with a meeting to understand your customers, your business and your challenges. We’ll work with you to define buyer personas and outline the customer segments you’d like to target. Next, our experts will perform an audit of your content and conduct interviews to identify gaps in your existing conversion paths. We’ll use that information in strategy meetings that map out the questions your buyers need answered before they’ll make a purchase. Once we’ve identified the type of content and opportunities you need to complete your conversion paths, we can help you to write and implement every word and strategy. If you already have a content team, we’ll provide visual strategy maps of your complete customer conversion paths, with all the direction they’ll need to implement our strategy themselves. If you’re consistently posting on social media without results, or you don’t know where to begin creating content for every stage of the buyer’s journey, our team can help you to understand why and how to remedy the issue. Unlike other agencies, the Impulse Creative team doesn’t use a one-size-fits-most process. We focus on understanding your business to create custom solutions that benefit all aspects of your growth, from strategy to implementation. Email marketing can still be incredibly effective for your brand with the right strategy, frequency and personalization. Have a conversation with your audience, drive traffic, and build relationships with your customers. AI technology can supercharge your customer service by setting meetings, qualifying leads, answering questions and more. Find the best platform to boost your business. Discover the land of review sites! 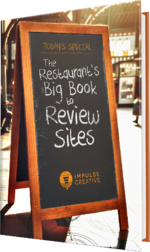 Just fill out the attached form and we'll send you the eBook that offers information on 13 review sites including how to claim or add your business.